Two goalkeeping errors from Roberto handed Porto the Liga Sagres title. Neither Oscar Cardozo nor Maxi Pereira were fit to begin the game for Jorge Jesus’ men, so Jara and Airton started. Andre Villas Boas brought back Helton in goal, and Nicolas Otamendi replaced Maicon at the back. Joao Moutinho came in for Fernando Belluschi in midfield. The start of the game was very scappy – it was stopped too many times by the referee, who also had to deal with some objects being thrown onto the pitch – this all created a stereotypically fractured and ill-disciplined Classico. The main feature of the first half was that the ball spent relatively little time in the centre of midfield. Both sides were looking to play quick, direct forward passes up towards their forward players, and the game was literally end-to-end stuff in the opening period. Porto’s strategy was to switch the ball across to the left flank, where Silvestre Varela remained wide. Airton stuck very tight to him and did a good job in 1 v 1 situations. On the opposite flank, Hulk, the man who dominated the previous encounter, was kept reasonably quiet by Fabio Coentrao, who confronted the Brazilian quickly and didn’t let him pick up speed and run with the ball. Benfica sometimes tried to play through Pablo Aimar, but aside from an early attack where he was cynically brought down on the counter, he didn’t manage to exert an influence on the game – a common feature of the ‘big’ matches he’s played in over the last couple of seasons. More often, it seemed Benfica were trying to play the ball to Jara in the channels, but he was often outmuscled and failed to hold the ball up. The opening goal came from a dreadful Roberto error – he pushed in a shot that wasn’t heading into the net, and Benfica equalised from the penalty spot after a foul on the edge of the penalty area. Neither goal owed much to design or unlocking the opposition defence, and both sides struggled for real creativity on the ball. 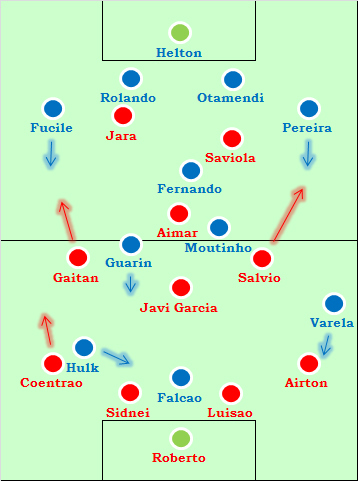 As the game went on, the midfield battle became increasingly important, and Porto admirably managed to dominate that zone despite having (in theory) one fewer player – they attacked directly through the middle and caught Nicolas Gaitan and Salvio in wide positions, exposing Javi Garcia ahead of his own back four. The move that resulted in Porto’s penalty was the only great football the game saw – slick passing through the middle ended up with Falcao being brought down by Roberto, and Hulk dispatched the penalty calmly. Jorge Jesus made two changes at the break. Jara and Aimar were both withdrawn – Cardozo came on upfront, and Cesar Peixoto went to the left, in tandem with Coentrao, whilst Gaitain moved into the centre. Gaitan was now the man Benfica were looking to for inspiration, but his only notable contribution was a bizarre, wayward shot from the halfway line. Benfica were slightly better in the second half but still rarely unlocked the Porto defence. Villas Boas instructed his side to sit deeper, and whilst in the first half Hulk and Varela were a little slow getting back, meaning Porto defended with only seven players, it was more of a 4-1-4-1 shape in the second half. Fernando was the game’s best player, sitting between the lines and breaking up play, whilst also distributing the ball calmly to the full-backs, pushing Porto up the pitch with the ball. The game really lacked any kind of purpose until the 70th minute, when Porto had Otamendi dismissed for a second bookable offence. Villas Boas hadn’t changed anything until then, and this gave Porto a new challenge – 20 minutes to preserve a one-goal advantage, with one fewer player. Villas Boas made two substitutions, removing both Varela and Falcao, bringing on another midfielder, Belluschi, and a replacement centre-back, Maicon. Porto then sat deep in a 4-4-1 formation, similar to how Inter held out at the Nou Camp last season. Hulk did a good job of being an nuisance upfront, whilst the midfield played very narrow, preventing Benfica from playing through the centre of the pitch. Benfica still didn’t play good football – their best hope was bringing Cardozo into play – he made a good impact, held the ball up well, and tested Helton a couple of times. Cardozo’s frustration got the better of him, though, and he was sent off in the closing stages for a late, wild hack. That should have signalled the end of Benfica’s efforts, but Gaitan’s shot was followed up by Salvio, who hit the post. Porto held out. “We showed who plays the best football”, said Villas Boas after the game. 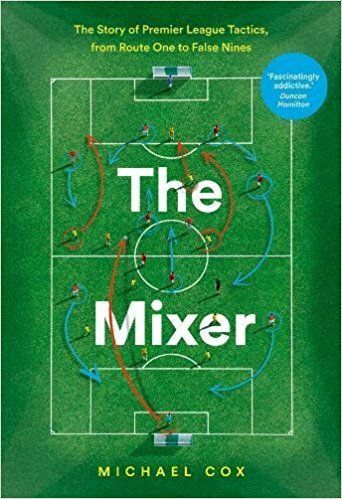 That is only half the story – frankly, there wasn’t much good football played, though the only good move of the match resulted in the decisive penalty. In terms of aesthetic beauty and symbolism, it’s a shame Falcao wasn’t able to put the ball in himself, as that would have wrapped up the title nicely. Benfica simply didn’t have enough quality on the ball, even with an extra player. None of the midfield four played well, and the result was that Porto managed to overpower them in the centre, partly through the strength and quality of their midfield three, but also through intelligent and reserved full-back play, casually supporting the midfield and making Benfica move across the pitch. Porto are deserved champions, and may well go the season unbeaten. I think in retrospect it does make sense that Porto would win the battle in midfield, considering that 2 of Benfica’s 4 in the diamond are more wingers than midfielders, when Porto had 3 clear CMs (and very good CMs too, it’s the strongest area of the team) permanently exploiting that space. But then that leads to the question of why don’t Benfica get caught out more often in similar conditions. I suppose that only happens when against a really strong midfield, because usually Salvio is remarkable in helping the defensive part of the game for a flamboyant winger, and helps to mask that weakness. Amusing to win the title in our rival’s home. This has certainly been the most dominant Porto team I can remember in the domestic scene, I hope now we can focus on the international scene to grab a Europa League title like Mourinho did. It certainly seems possible, more than it did at the time, although I’m wary of potentially facing Villarreal in the semis. Guarin has really improved as a player this season under Vilas Boas. Its been a pleasure seeing him play lately. Much wiser when he has the ball. Last season he was always loosing the ball cheaply, use to be very annoying. I agree, Guarin has become this season a dynamic all-round midfielder, He grew alot in compararion to his performances in the previous seasons with coach Jesualdo, he was a limited players in terms of attacking approach to the game. Villas-Boas gave him more confidence and liberty to on the pitch. Porto was a deserved winner of the Portuguese League. They do not play an attractive attacking football, but they are very consistent and have the advantage of having a stronger squad, the diference between the players on the field and on the bench are not that diferent, and that gives them the upper hand. Falcao is such an awsome center forward, Hulk needs just to be able to play more with the team. In terms of Benfica way of play, i don’t think that Jesus can continue to be so stubborn and only use Javi to dominate mildfield, last year Ramires (now-Chelsea) gave a helping hand in the center of the pitch, the dymanic was very diferent. In todays football, to play a solo man in defensive midfield, with little help from only attacking minded players that have to roam from there position is suicide. I don’t know if this strategy is gonna be good against PSV, they have a weak defense, but they have a good midfield and are really fast in counter-attacking plays. Awsome to see another review of the two best teams in Portugal. 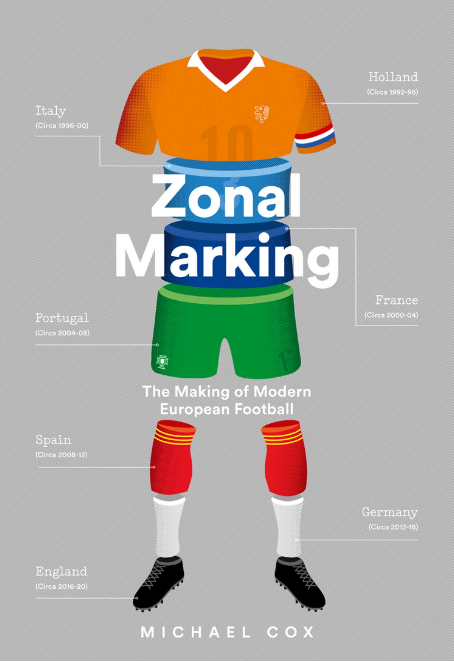 Thank you ZonalMarking. Love you reviews. Porto didn’t play good football? Tactically they were brilliant, the defense made it seem easy, the midfield had more possession despite playing in the stadium of the main rival and had Falcao been his usual self then thiss would have been even more historical. Porto’s attack was selfish and wasteful, less today than normally, but I’ve never seen so much selfishness in one team’s attack. Everyone wants to go for glory, and they miss and their teammates aren’t too upset. Other teams would yell at each other for wasting such opportunities or for not passing when they could. nah…i don’t think so. andre villas boas’ team are all about teamwork. they have a great team spirit and i doubt their selfishness. This game was kind of disappointing, since this are the two best teams playing in Portugal. The atmosphere didn’t help, with those hooligans made in Portugal. The next match between this two teams, for the Portugal Cup (literal translation, correct me if I’m wrong ), should prove more interesting, since Benfica has a two away goal advantage (0-2), and they play home in this second hand. The game is on the 20th April. Are you interested in covering this ZM ? This could have been a much better match, tactically and for the supporters if the referee wasn’t so dumb. He started the match really bad by stopping an Aimar counter-attack. Then, he whilsts an outrageous penalty for Benfica (giving an unfair yellow card to Otamendi). Then in the 2nd half he gives Otamendi the 2nd yellow card with no reason at all. In the meantime there were stupid yellow cards, uncalled penalties, uncalled red cards, well… many things why don’t feel like telling them all here. Sorry, ZM I know this is a tactics blog, but this is a great example in how a referee can ruin a potential tactically beautiful classic. I would like to point out one mistak in your review ZM. Gaurin does not sub for Moutinho. Porto have had for most of the season a stable midfield compose of Fernado(Defensive midfeilder), Moutinho(Attacking and centeral Defensive Midfielder, recovering balls and pressing high in the pitch) and Belluschi(Attacking Midfielder the Playmaker).This has been the PLAN A.
Guarin’s orignal position was as a Defensive Midfielder, howver the duel between Garin and Fernado ended in the latters preference, (when Fernando is unavailable Guarins subs him). When Moutinho join the club he Lost alot of space in the squad. It is in the PLAN B that Guarin enters and changes the dinamic of the team, He subs Belluschi in the midfield, becoming a attacking midfielder. That means that Porto’s Midfieldr has 3 Defensive midfielder two of which can also attack. Fernandos position stays the same but Moutinho and Guarin become two central/attaciking midfielders covering the defense when one of then goes forward. Moutinho fills in as playmaker in the center and going forward up the pitch. Guarin assumes the roll of a attacking midfielder with his long range shots and advancing high up the pitch ready to collect a ball from the edge of the box and shoot, he is however less of a playmaker than Moutinho. Plan A has been used mostly thru the season, Plan B is use against a strong defense which doesnt allow ball to be played inside the box and when the the opposing midfield is stronger or more numerous.